From The Publisher: If every hockey player’s dream begins on a frozen pond, it reaches its pinnacle in a packed arena facing off against a bitter international rival. Could be the mighty Soviets. Could be the vainglorious Americans. Doesn’t matter, as long as the guys, and more recently, the women, who come from the farming villages, logging towns, and bustling cities of Canada show up to play the game the way we invented it to be played. That’s the way it’s been for a hundred years. No game matters more than the one that pits our best against the world’s best. From the earliest days of the past century, when milkmen still did their rounds in horse-drawn carts each morning, to the Sochi Olympics, where both the men and women stood on their blue lines with gold medals around their necks as the Canadian flag was raised. 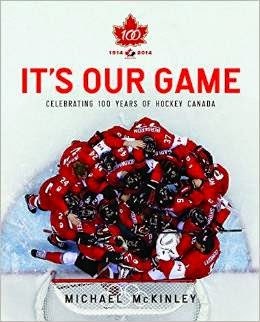 This beautiful book, with rare archival images, celebrates a hundred of the greatest moments from Hockey Canada, the organization that has given Canada its most cherished hockey memories. It’s Our Game is the definitive account of a century of Canadians working to be the best at the sport they love most.